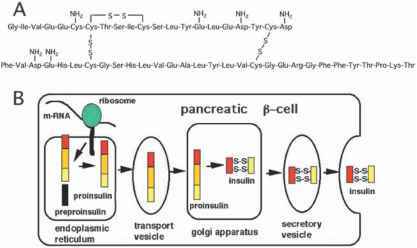 To try and measure G protein activation directly and in intact cells, many labs have explored using RET-based approaches. Janetopoulos et al. were the first to succeed in resolving kinetics of G protein activation by means of FRET in Dictyostilium discoideum by attaching CFP and YFP variants to Ga and GPy subunits, respectively. In cells coexpressing both fluorescent G protein subunits, FRET signals decreased during activation, suggesting an increase in distance between CFP and YFP, which is in accordance with the classical concept of activation-induced subunit dissociation  . The first publication on FRET-based detection of mammalian G protein activation demonstrated a counterintuitive increase in FRET between Gai and GPy subunits upon activation, not compatible with complete separation of G protein subunits (see Fig. 10.2)  . Rather, the results supported the concept that G protein sub-units did not completely separate prior to functionally regulating their effectors, an idea originally proposed by Levitzki and coworkers  . which has gained more acceptance .59] . BRET technology has also been successfully applied to study complex formation within the G protein signaling pathway  . The results from these studies also support Levitzki's concept. It should be noted however, that the published data so far do not predict that Ga and GPy subunits, once formed, will stay together as a lifelong trimer. A recent study that uses a specialized fluorescence recovery after photobleaching (FRAP) approach to study stability of protein-protein interactions actually demonstrated a decrease in stability of Ga/GPy interaction upon receptor. mediated interaction in intact cells [ 61]. In contrast to Gi proteins, FRAP measurements indicated activated Gas and GPy subunits continue to form stable complexes i 61] . RET-based detection of G protein activity has been successfully applied to Gi/o-, Gz-, Gq-, and Gs-proteins [31,57,62]. The ability to study receptor- dependent activation of G proteins in a subtype- specific manner makes the FRET approach unique. Figure 10.2 Interaction between heterotrimeric G proteins and receptors determined by FRET. Receptors labeled at the C-terminus with YFP (Y) and G proteins containing a CFP moiety at the N-terminus (C) will allow for FRET upon interaction as indicated in the upper scheme. The time course of agonist-induced alterations in FRET are illustrated in dependence of agonist concentration. activation for small molecule neurotransmitter receptors typically exhibited time constants of less than 100 ms [29, 31] - subsequent G protein activation required several hundreds of millisecond [31, 57]. 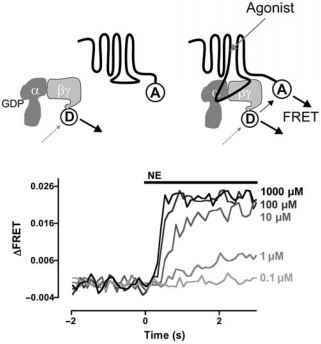 At high expression level of receptors as well as G protein kinetics of the actual coupling between receptors and G proteins as detected by FRET was not different compared to receptor activation [30, 31]. However, lowering G protein expression levels to endogenous levels of a HEK cell did result in a substantial slowing of the interaction kinetics  - in line with collision-coupling models. Considering that expression levels of endogenous receptors in many cases are considerably lower compared to those of the above-mentioned studies, we have to expect that receptor-G protein interaction might as well be a speed-limiting step in the initial steps of G protein signaling.